This unit places you in the outpatient clinical setting with Dr. Jobes and at-risk patient Kevin O’Leary. Together, the three of you will partner to apply the CAMS framework to reduce Kevin’s lethality, and see if you can keep him out of the hospital by working together to manage and treat his suicide risk. 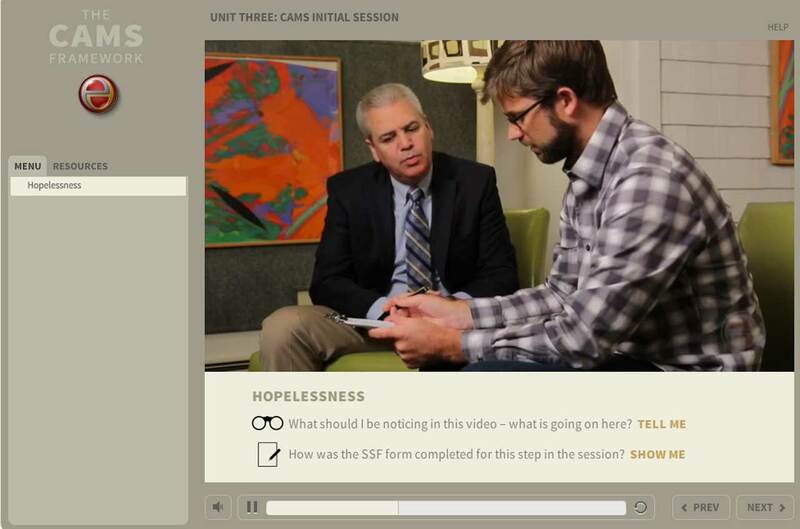 Unit Three focuses on the initial session of CAMS care, showing you how to best apply the Suicide Status Form (SSF), starting with the assessment sections to fully grasp Kevin’s current lethality. Then, you’ll work with Dr. Jobes and Kevin to co-author a treatment plan that will keep Kevin safe, ideally without hospitalization. 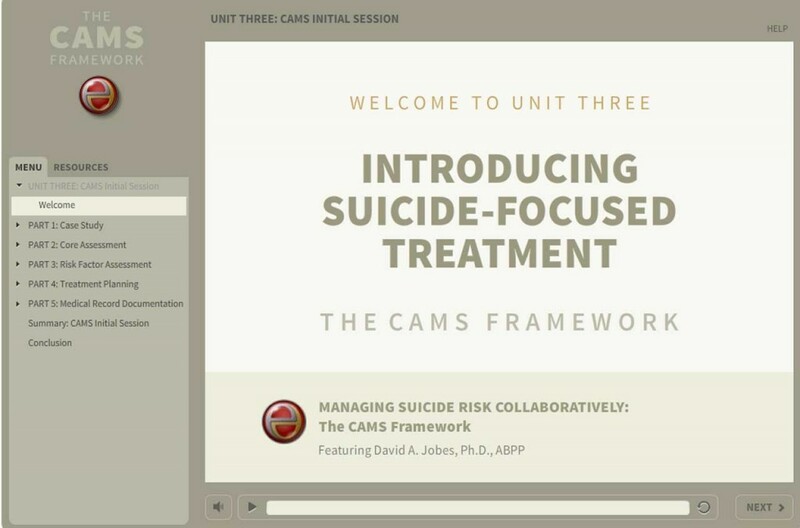 This unit introduces CAMS suicide-focused care and is the most in-depth of all the units in this training. For the first time you'll meet Kevin and Dr. Jobes within the clinical outpatient setting. 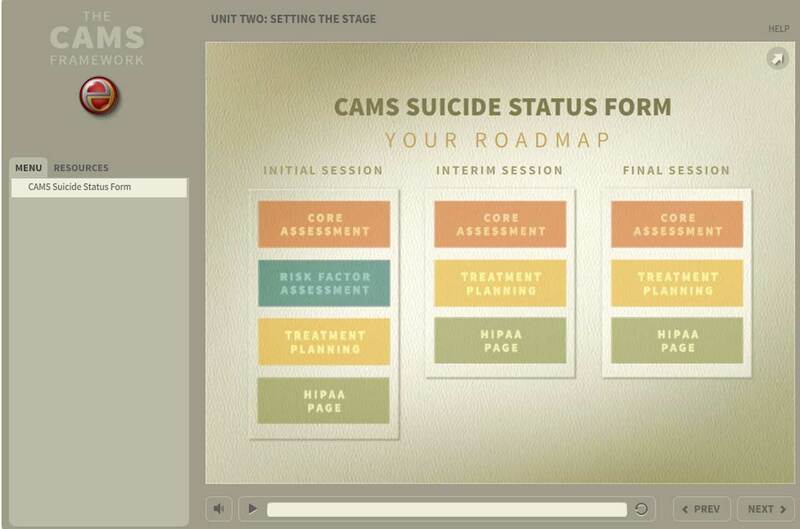 And together with them, you'll move through assessment and treatment phases of the session, using the CAMS Suicide Status Form (SSF) as your roadmap. 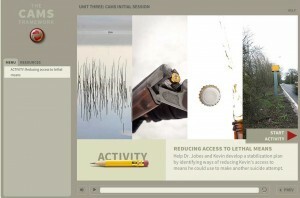 All in-session videos with Dr. Jobes and Kevin feature informative links in the slide footer. These TELL ME and SHOW ME links activate slideouts with more information as supplementary text, audio and video. TELL ME gives you key points to watch for in the video. SHOW ME reveals the CAMS Suicide Status Form, and the section within it that the current video addresses.